Finance Costs > How Much Does an ATM Machine Cost? An ATM, or Automatic Teller Machine, can provide your customers with the convenience of getting cash when it is needed. For retail businesses, installing an ATM on site can result in increased foot traffic and higher revenue while reducing the chances for fraudulent checks, insufficient funds, and credit card fees. There are a variety of factors that can affect the total cost of an ATM when you want to purchase one outright. On average, a pretty good machine can cost anywhere from as little as $2,000 to more than $15,000. The costs will depend on the level of security features, the size of the screens, how many notes it can hold and its level of technology. The best sellers, in most cases, will be in the $2,000 to $3,500 range. For instance, if you were to purchase an ATM that uses a basic keypad with a dial-locking safe that connects to a phone line, then the costs could be much less than a touchscreen with a WiFi connection, according to FitSmallBusiness.com. If you don’t $5,000 to start off with, then highly consider an ATM placement or partnership. An ATM placement, for example, is when the ATM provider will do the majority of the work, from purchasing the machine to paying to have it installed. They will also manage the cash and even ship it to your business. With this type of agreement, you will have to pay the provider up to $0.50 to $1 per transaction since they are doing most of the work. The other issue, however, is that a placement is guaranteed since most companies will want to see a minimum amount of transactions before they work with you, usually around 250 to 400 transactions per month. If you don’t do a lot of transactions, then you may be able to find a partner, but the transaction costs will be about 50 percent more than average. A partnership, unlike a placement, is similar to that of a two-way street. In this scenario, you can either lease to own the machine and/or have the company provide the cash up front. A partnership can often take 50 percent of your profits, plus the leasing fee, which can range from $50 to $100 per month. According to ATMMachine.com, you should be prepared to spend $2,000 up to $15,000, but they mention most of the best sellers are less than $3,000. Most ATM machines will be similar in features, but the key difference will be how the machine connects, either via a phone line or the Internet. Also, security features can differ. An outside machine, for example, would need to be more advanced in its security. Three types of ATM machines exist on the market, including the freestanding, countertop and built-in ATM. A freestanding machine, the most popular choice, is typically two feet by two feet and will be simply that — a machine standing on its own. A countertop machine is designed for a smaller business with less-than-average floor space and can sit on top of a counter. Lastly, a built-in ATM will be similar to the machines at a local bank. These machines will require construction work to properly fit the machine and can offer the highest security features. Popular brands include Hyosung, Trinton Traverse, Hantle ATM’s, Genmega, and Nautilus Halo series.. 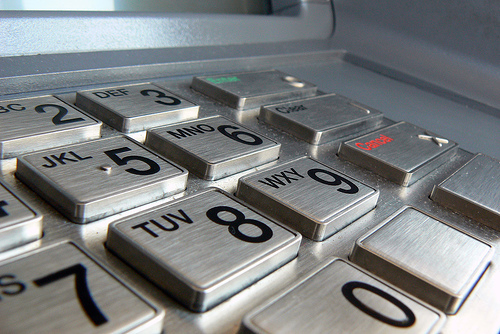 Even if you purchase an ATM outright, the costs don’t end there. Remember, you will have to stock the machine with cash, with the average owner placing $2,000 inside of the machine; however, some owners can get away with as little as $500. While this isn’t an “extra cost” per se, it can be added to your startup expenses. Most machines are capable of holding up to $20,000. ATM insurance is highly recommended in order to protect you in case of theft or damages to the machine. A good policy can cost about $30 to $60 per month, depending on the coverage and the insurance company you choose. Connection costs, if you were to use either a landline or Wifi, can cost another $30 to $80 per month; however, if you already have these connections available within your location, then you can either consider adding a second line or bypassing the cable Internet costs altogether. Depending on the processor and contract you choose, you may have to pay a transaction fee, which can be about $0.30 to $0.50 per transaction. An additional cash cassette, if your ATM allows it, can be an additional $100 to $500 per cassette. A cash loading service, if you didn’t want to deal with this, could cost $50 to $75 per trip. Like most electronics, problems are bound to happen. Be prepared for any repairs you may need in the future. When buying or even leasing, be well aware of the fees before signing a contract. As a general rule of thumb, three to five percent of those who pass through your doors will use your ATM. If you know what kind of ATM machine you want, see if you can find a used machine either on eBay or Craiglist. Craigslist can be a great option since it’s local, meaning you won’t have to pay for shipping fee. If you’re lucky, you may be able to find a local business that’s either trying to get rid of their unprofitable ATM machine or may be upgrading to a better version.